Herodotus (484–425 BCE): Sometimes dubbed the father of history (q.v.). Of course, the same has been said of Confucius (551–479 BCE). History: A discipline dedicated to proving that the past is not what it’s cracked up to be, and never was. First courses at Reed focused on Greece and Rome. By 1916, the college was offering courses on the Middle Ages, the Renaissance, the Protestant Revolt, and the French Revolution. Far more classes have been taught over the years on British and European topics than on American. Fascinating courses have included The History of the Pacific Northwest (taught by Dorothy Johansen ’33), The Third Reich, History of Zionism and the Arab-Israeli Conflict, Peasants and the State in China and Japan, Jewish Mysticism, East Asian Business History, Technology and Society in America, and Marx and Jesus. Influential profs (q.v.) have included Rex Arragon [1923–62], Dorothy Johansen ’33 [1934–84], Richard Jones [1941–86], Owen Ulph [1944–79], Charles Bagg [1946–74], Frank Smith Fussner [1950–75], John Tomsich [1962–99], George Fasel [1963–70], T.C. Price Zimmerman [1964–77], John Strawn [1970–77], Christine Mueller [1973–2005], Ed Segel [1973–2011], David Groff [1976–87], Ray Kierstead [1978–2000]. Richard Fox [1981–90], David Sacks [1986–], Douglas Fix [1990–], Jacqueline Dirks ’82 [1991–], David Garrett [1998–], Tony Iaccarino [1999–2007], Michael Breen [2000–], and Benjamin Lazier [2005–]. Hum 11(0): History as understood by poets, literature interpreted by philosophers, phil-osophy explained by artists, and art seen by historians. Welcome to Freshman Hum. The broad outlines of the course were originally laid down by President Richard Scholz (q.v. ), but his untimely death in 1924 derailed his dream for almost two decades. The first true humanities course at Reed arrived in 1943 under the leadership of Rex Arragon [history 1923–62]. Then as now, the course focused on Greek and Roman civilizations through the prisms of politics, art, history, religion, philosophy, and literature. Hum 110 was later expanded to the Middle Ages and beyond, but this was felt to be too burdensome, and in 1993 its focus returned to Greece and Rome. Reed has also employed the framework of the humanities to approach other crucial periods and cultures. Since 1995, for example, the college has offered Hum 230, focusing on the foundations of Chinese civilization. Hum Play: Annual slapstick production occurring after the final Hum lecture of the year. Hum Play follows the adventures of the hapless Student, who journeys through the Hum syllabus in a desperate attempt to learn a year’s worth of material the night before his final. The show features bedsheet togas, cardboard spears, and an inexcusable number of bad puns. Guided by Greek gods, epic poets, and fearless professors, Student runs across several characters from the syllabus before arriving at Enlightenment. The play began as the brainchild of Greg Lam ’96, who staged the first production in 1994. Since then, the script has been passed down from one generation to the next, each adapting it to create more outrageous iterations. Human hamster wheel: Behemoth roller bearing that materialized in the SU in 2010. Over 12 feet in diameter, the wheel was constructed of lumber, plywood, and skateboard components, and was big enough for a student to run inside. Student group named “Defenders of the Universe” claimed responsibility. Iliad: Sing, goddess, the anger of Peleus’ son Achilleus. Keezer, Dexter M. [preZ 1934–42]: Educator, journalist, and New Deal economist, Keezer arrived on campus at the nadir of the Great Depression. Believing that Reed was too intellectual, Keezer worked on improving student life with initiatives such as the ski cabin on Mount Hood. After Reed, he worked for the federal government on the war effort. Koblik, Steven [preZ 1992–2001]: Koblik came to Reed from Scripps College, where he served as the dean of the faculty. A historian known for his friendly demeanor and emphasis on transparency, he took student pranks, many of which were directed at him, with grace and humor. He was credited with reuniting a faculty that had suffered a rift. Koblik’s 10-to-1 initiative sought to improve the student–faculty ratio by adding 15 new professors. Although he inherited a budget deficit of over $1 million, by the time he left, the endowment had tripled to $349 million. Although he often said he didn’t want to be a “construction president,” the face of Reed’s campus changed dramatically during his tenure with the addition of the Educational Technology Center, the Gray Campus Center, Kaul Auditorium, and the Bragdon, Naito, and Sullivan dorms. Koblik also decided to stop participating in U.S. News & World Report’s annual “best college” rankings, a courageous move that drew national attention to the survey’s capricious methodology. After Reed, Koblik become president of the Huntington Library. In the groove: unidentified KRRC DJ spins vinyl, circa 1985. KRRC: Persistent intermittent presence haunting the radio dial. 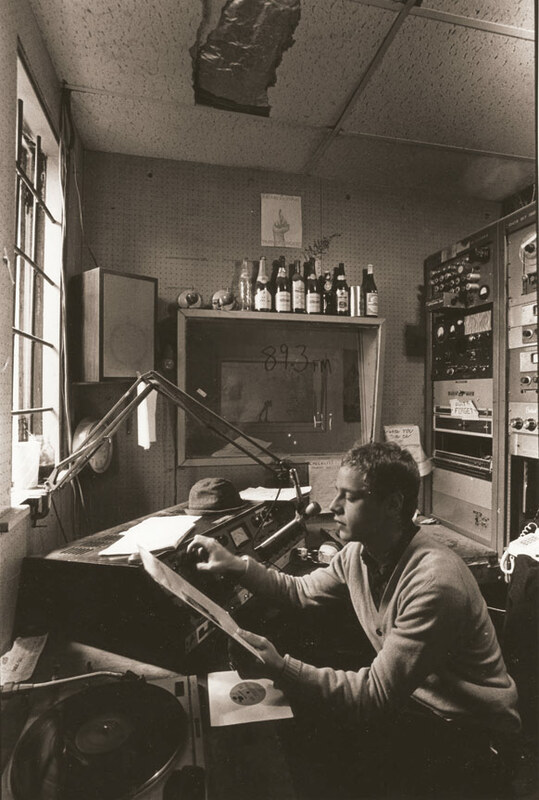 Origins date to 1954, when students organized the Reed Radio Club to pursue “the technical and programming aspects of radio broadcasting.” A year later, KRCB-AM, the Radio Voice of Reed College, debuted at 660 AM to the delight of students and a few neighborhood residents. Broadcasting from the basement of Doyle, Radio Reed from its beginnings played the music no one else was playing. The club later persuaded the FCC to grant an FM license and became KRRC-FM 89.3 in 1958. Equipment—including the transmitter and antenna—was built, donated, borrowed, and generally cobbled together by students. An Oregonian article noted that “austerity vies with ingenuity” in the studio, where “egg cases and an old ice box play important roles in achieving a high quality of low fidelity.” In the early decades, highlights from the station’s program included poetry, film reviews, news, the Kinks playing live at Reed, and the Epistemology of Rock with Marvin Levich [philosophy 1953–94]. Still, austerity and ingenuity have been ongoing themes, as the station has faced frequent technical difficulties, financial troubles, and sometimes contentious interactions with the FCC. After losing space in the airwaves to a Christian station in the 1970s, KRRC moved to 104.1 FM, where it remained until the 2000s, when it was bumped to its current perch at 97.9 FM. Nonetheless, the station has prevailed. While the signal—when it is working—barely extends past Woodstock Boulevard, its limited range allows student DJs to take full advantage of the joy of radio without too much fear of getting into hot water with the authorities. It is hard to think of a musical genre the station has not explored. From Gregorian chant to psychedelic funk to Hungarian gypsy bagpipe, KRRC plays it all—and then some. Thanks to the advent of digital radio, the station has escaped into cyberspace and can now be heard at krrcfm.com. Linguistics: The art of misunderstanding many languages at the same time. 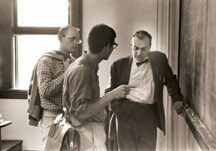 Linguistics was first formally taught at Reed in 1955 under anthropology (q.v.). Intriguing course titles have included Psycholinguistics, Signs, and the rather intimidating subject of Morphosyntactic Typology. The linguistics qual consists of a long passage in an unidentified language, accompanied by a translation, and asks the aspiring linguist to describe the characteristics of that language. Have a nice day. Influential profs (q.v.) have included Edwin Gerow [1985–96], John Haviland [1986–2005], and Matt Pearson ’92 [2001–]. MacNaughton, E.B. [prez 1948–52]: Prominent Portland businessman, one of the original members of the board of regents (later merged with the board of trustees). As president, “Mr. Mac” focused on Reed’s finances, securing numerous gifts, forging key relationships, and rescuing the college from the brink of insolvency. One of his first actions was to hike faculty salaries, which gained him popularity among professors. MacNaughton also served as chairman of the board of the First National Bank and president of the Oregonian. A typical day included mornings at the bank and the newspaper, and afternoons at Reed. MacNaughton was utterly dedicated to the “greatest little college in the world” and refused to accept any compensation for being president. In 1944, he married administrator and instructor Cheryl Scholz, the widow of Richard Scholz, who also devoted many years to Reed. Magic Grove: Cluster of flowering cherry trees designed and planted by early professors on the Great Lawn. Manorial documents: A staple of Hum 11 in the ’50s and ’60s. A standard assignment would be to write a paper on these documents, which were extracts from the Domesday Book. 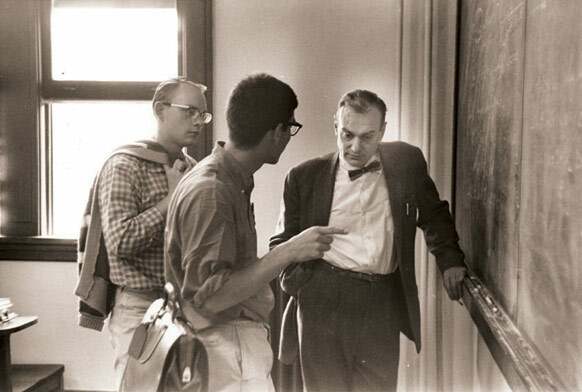 Math professor Lloyd Williams ’35 with students at the blackboard, circa 1962. Mathematics: “A subject in which we never know what we are talking about, nor whether what we are saying is true” (Bertrand Russell). Reed has taught the discipline in dimensions both theoretical and applied. In 1918, the department taught a course on war mathematics. On the theoretical side, there was Construction of the Real Numbers (see 1 + 1 = 2). Other intriguing courses have included Astronomy, Probability, Automata and Languages, and Computer Architecture. Influential profs (q.v.) have included Frank Loxley Griffin [1911–56], Jessie May Short [1920–39], Robert Rosenbaum [1939–53], Louise Robinson [1940–53], Lloyd Williams ’35 [1947–81], Joe Roberts [1952–], Jack Dudman ’42 [1953–85], Burrowes Hunt [1953–77], John Leadley [1956–93], Hugh Chrestenson [1957–90], Dorothy Williams [1959–65], Thomas Dennehy [1962–79], Tom Wieting [1965–], Rao Potluri [1973–], Ray Mayer [1974–2002], Joe Buhler ’70 [1980–2005], Albyn Jones [1986–], Jerry Shurman [1989–], David Perkinson [1990–], James Fix [1999–], James Pommersheim [2004–], and Irena Swanson ’87 [2005–]. Music: The literature and linguistics of a wordless language. Music has always played a vital role in campus life, but was not part of the academic curriculum until 1935, when the college offered a course, Introduction to the History and Appreciation of Music. The tempo increased with the advent of Herb Gladstone [1946–80], who for many years was the department, teaching academic courses, supervising theses, and leading the orchestra. Reed has offered some fascinating courses over the years, including Wagner, Brahms, and Mahler; Song; Jazz; Music Since 1968; The Madrigal; Music and Science; The Music of Duke Ellington; and Bebop. Besides Herb, influential figures have included Edna Chittick [1931–39], Frederic Rothchild [1968–78], Leila Birnbaum Falk [1969–2009], David Schiff [1980–], Mario Pelusi [1982–89], Bonnie Garrett [1988–2010], and Virginia Oglesby Hancock ’62 [1991–]. Nightmares, recurring: Fantasy writer David Eddings ’54 was haunted by a question on an ethics final by Ed Garlan [philosophy 1946–73]: Explain the difference between Right and Good. “I had nightmares about that one for years,” Eddings said. Nitrogen: You can’t see it. You can’t smell it. You can’t taste it. It doesn’t burn, explode, alter consciousness, or make you talk funny. It is anything but rare. In fact, it may seem rather dull. Yet this underrated element gets the recognition it deserves at Reed, which has celebrated Nitrogen Day since 1992, when a group of science majors (including Dave Weinstock ’92, Rob Mack ’93, Nick Kaplinsky ’93, and Al Kun ’95) staged the first celebration of the seventh element. The original N-Day featured a brass band, a barbecue, and an ode to the triple bond. Subsequent bashes have featured nitrogen-infused beer and ice cream cooled by nitrogen. Odegard, Peter [prez 1945–48]: Political scientist who taught at Williams, Ohio State, and Amherst before becoming Reed’s sixth president. Odegard worked to shore up faculty salaries, hire more professors, and expand Reed’s geographic draw. He also boosted attention to the arts and oversaw upgrades to campus buildings. Students and faculty alike saw Odegard as a champion for the community and its intellectual history. Declaring that a college “must be something more than an intellectual delicatessen store,” he insisted that Reed “serve as an island of free inquiry, for only by free inquiry can the frontiers of knowledge be advanced.” Odegard left Reed to join UC Berkeley as chair of the political science department. Odyssey: Sing to me of the man, Muse, the man of twists and turns. Olde Reed, last year of: When you are a student, it’s the year you arrived minus 1. When you are an alumnus, it’s the year you departed plus 1. 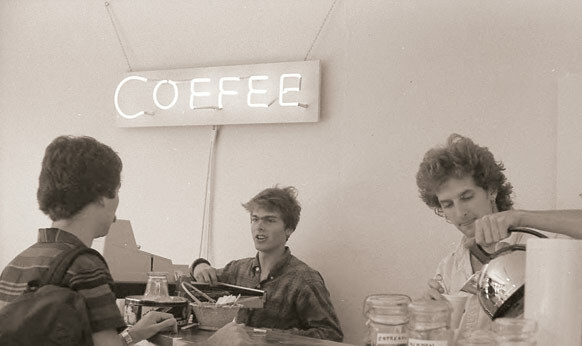 Paradox Café circa 1985. Michael Donally Goldman ’89 scoops nickels; Mike Magrath ’84 pours joe. Photo Larry Clarkberg ’88. Paradox Café: Student-run coffeehouse in the SU famous for its paint-peeling brew. Philanthropy: Term coined 2,500 years ago by the author of Prometheus Bound to describe a love of humanity, as demonstrated by the eponymous titan who stole fire from the gods and gave it to humankind. 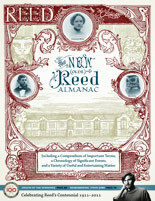 Philanthropy is also the cornerstone of Reed, which was founded with a bequest from Amanda Reed. When her will, stipulating an “institution of learning,” was made public in 1904, it caused a sensation. Rather than secure the wealth of her own family, Amanda chose to strengthen the community and alter the fabric of the society in which she lived. After an epic legal battle, her nephew, Martin Winch, transferred $1,821,560 (approximately $44 million today) to the Reed Institute. Gifts are crucial to Reed’s existence and its growth. Big gifts make good copy, but all gifts make a difference. Of the 336 grads of the class of 2011, roughly 52 percent received financial aid, with the average award weighing in at $34,196. Gifts have also allowed the college to break ground on a long-awaited $28 million performing arts facility and launch an ambitious environmental studies program.